It’s kind of a miracle. Around our house, it is tied with coconut oil as the “MVP” of Household Staples. Vinegar has amazing healing, and nutritional benefits and is exceptional when used for cleaning. It has been used for centuries. 2,500 years to be exact; making it the oldest known product in use by humans. It’s magic ingredient is acetic acid, which makes up about 5% of the finished vinegar. Vinegar is a workhorse for an abundance of tasks in daily life. The cleaning abilities of vinegar are second to none, along with it’s purifying and degreasing abilities. It is a great substitute for things that you might use bleach for, and also a key ingredient in many homemade cleaners. In my tiny little humble opinion, there’s nothing vinegar can’t do. I wanted to share a few of my favorite household applications with you, and perhaps inspire you to quit your Lysol, Clorox, and Windex bad habits 🙂 Not only are you going to save a ton of money on cleaners, but you will be making great strides toward living a non-toxic life. With so many toxins I can’t avoid, it feels good to consciously be able to control what I clean with. It is about getting clean after all. 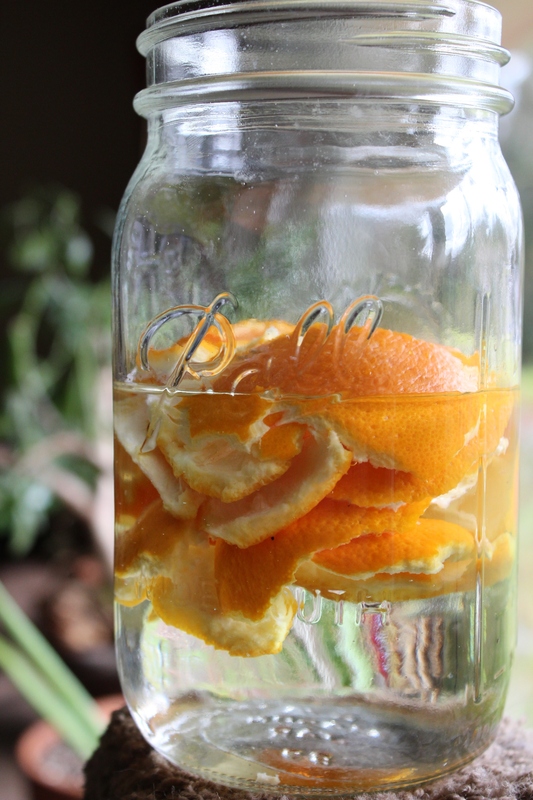 I like to save my citrus peels, particularly orange, and pour white vinegar over the top of them and let them steep for a few days. (Remember to shake every now and then). I then pour the infused vinegar off into a spray bottle and use a 1:1 ratio of vinegar and water. With this yummy smelling vinegar spray I manage to do a lot. I keep the bottle in my kitchen and thoroughly clean my produce, counter tops and all other kitchen surfaces. I dust with this, wipe up the sink in the bathroom with it, and clean my mirrors. For tougher jobs, I add white vinegar to other simple ingredients and make super-frugal homemade cleaners that make me feel awesome, old-fashioned, and resourceful. Vinegar is also great for cleaning your coffee pot, running through your dishwasher as a rinse-aid, and is used as a degreaser on dishes and other random stickies and stinkies. Vinegar is also a friend to the laundry. It is an ingredient in homemade laundry soap, but also performs amazing as a fabric softener. I add about a half-cup or less to the softener section of my washer, and my clothes come out soft, but with no lingering aroma; of vinegar or those nasty dryer sheets. They are too strongly scented for me, and have stuff in them I can’t pronounce. A total turn off. Acetic acid won’t harm fabrics, repells mold and mildew, dissolves soap residues, and prevents static. I don’t use white vinegar much in the culinary area, just because there are so many better choices, but I do like to infuse white vinegar with herbs for cooking. Last summer, I grew a fantastic, and new to me, variety of basil called lemon basil. It was the most fragrant, delicious, and versatile basil I have experimented with, and it is definitely getting a second showing in the garden this year. All of my basil had a prolific year, and when I tired of pesto making, I crammed a handful of the lemon basil into a mason jar, and poured white vinegar over the top of it. I shook it daily for a few weeks and strained. It came out beautifully, and is a powerfully scented and flavored vinegar that I am loving for cooking. I’ve been throwing it in sauces, vinaigrettes, soups, and stir frys. I have the better part of a quart of it, so I’ve had to get creative. I have compiled a list of old wisdom of the various applications of white vinegar. This list goes on and on. This list is in no way exhaustive, but Reader’s Digest attempted an exhaustive one that is sure to impress, and you can find that here. Click here for yet another helpful resource. If you have any tips or tricks to share about vinegar, I’d love to hear them! (Especially the ones your grandmother’s have passed down). I use vinegar for everything too! I would add that you can use it to wash fruits and veggies as well! Brilliant – I especially like the citrus peel idea. If you would like to guest post at Mumtopia any time, please let me know. Alison! Thanks for the sweet offer 🙂 I’d love to. Let’s chat. My husband and I have a list of “magic” things in our house. Vinegar, coconut oil, and breast milk are the three major ones! Vinegar kills 99.9% of virus and bacteria….that’s what Lysol claims to do! Go Vinegar! So interesting. So far I’ve only really used vinegar for cleaning sprays but great to find out more uses for it. I too have discovered the joys of vinegar for cleaning and laundry. I can no longer tolerate the stinky, toxic bathroom cleaners–they make me cough. Rene, I completely agree. That’s what started my love affair with vinegar. Commercial cleaners are so horrible, and horribly expensive! I love cleaning with vinegar. I use it for everything. Thank you for linking up at Wildcrafting Wednesdays! I am about to make my first vinegar based weed killer. Got any suggestions of other things to add for killing weeds? I have been reading about mixing in salt and/or dishsoap, any thoughts? I’m going to try the orange peel thing today. We are snowed in and I am taking advantage and doing some serious house cleaning. Thanks.